Since we started our travels, we’ve managed to acquire somewhat of a bad reputation as bringers of rain. Our visit to Montreal last August was a washout, our subsequent trip to New York coincided with Hurricane Irene and our move to Barcelona in autumn saw the city become a swimming pool as the drainage struggled to cope with deluge after deluge. In Amman in February and March the rain turned to snow, an event rare enough event that social media was set abuzz, with even Queen Rania tweeting pictures of her kids’ snowman. Rainstorms continued for much of the month and we were even treated to an odd hail-slash-sandstorm – hailstones containing sand pelted down, only to melt and leave mini sandbanks on the street. 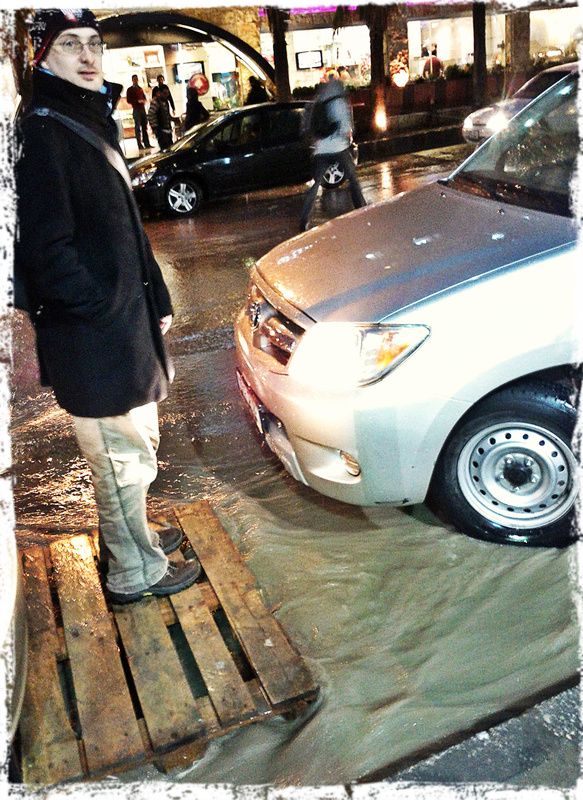 Stacker attempts to cross the river, I mean road, in Amman. When we managed to bring a short rain shower to Dubai during a 4-day visit, our nickname of “rain-makers” was well and truly sealed. Shareholders in umbrella companies (erm, I mean the kind that actually make umbrellas) have started tracking our movements. No surprise, then, that when we came through the UK for a week in April this year, the skies literally opened up as we touched down. It turned out to be the wettest April since records began. The “We Are in Drought” posters we saw plastered in many Tube stations was clearly someone’s idea of a sick joke. So it was a pleasant development in our catalogue of rainy days that we happened to be back in the UK for St Swithin’s Day, the 15th of July, when it dawned bright and sunny without even a wisp of raincloud. The legend of St Swithin’s day holds that if it rains on his day, it will rain for the 40 subsequent days and, should it be fair weather, the reverse will be true. 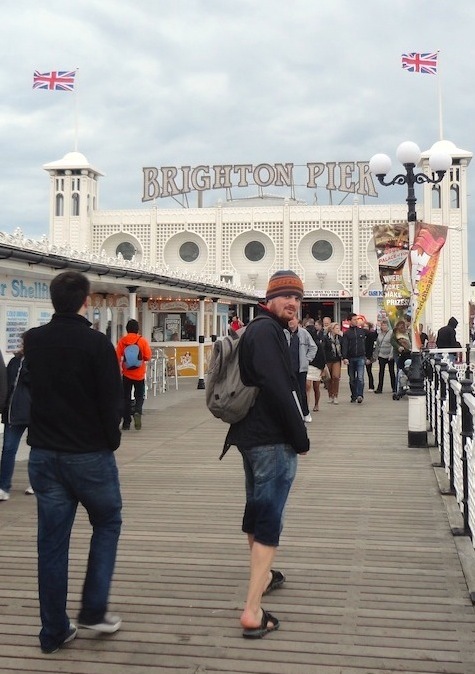 It was certainly looking promising and if there’s one thing you can count on crossing a Londoner’s mind – as it has for centuries past – on a fair weekend morning it’s spending a day at the historic seaside town of Brighton, often nicknamed London-By-The-Sea. My brother Fonz, who’s been enduring London’s soggy weather for the past few months, suggested it and it only took one look at the sun streaming through the window to convince me. We got a sneezing Stacker on board by telling him there’d be less pollen on the stony beaches of Brighton and soon we found ourselves on a southbound train to the sea. Stacker texted ex-Brightonian Abu Debbie for tips on what to do and where to eat and following her advice, as well as in the footsteps of centuries of tourists, we attempted to show Stacker what a traditional British day out by the sea entails..
Soft white fish, generously battered and deep fried along with chunky chips doused in malt vinegar and, if you’re feeling the need for something green, a decent helping of mushy peas. The quintessential British comfort food. Growing up, going to the local “chippie” was a special treat and I’ll always remember the excitement of carrying home a couple of warm packets wrapped in newspaper, the grease slowly seeping through, opening them up directly on the kitchen table and everyone diving in without the need for utensils or decorum. If there’s one thing that’s for sure about fish and chips, it’s that it certainly ain’t posh. However, upturns in the price of fish and the rise of cheaper and more exotic alternatives have contributed to the disappearance of chippies across the country, including the one we used to visit, which is now a kebab shop. 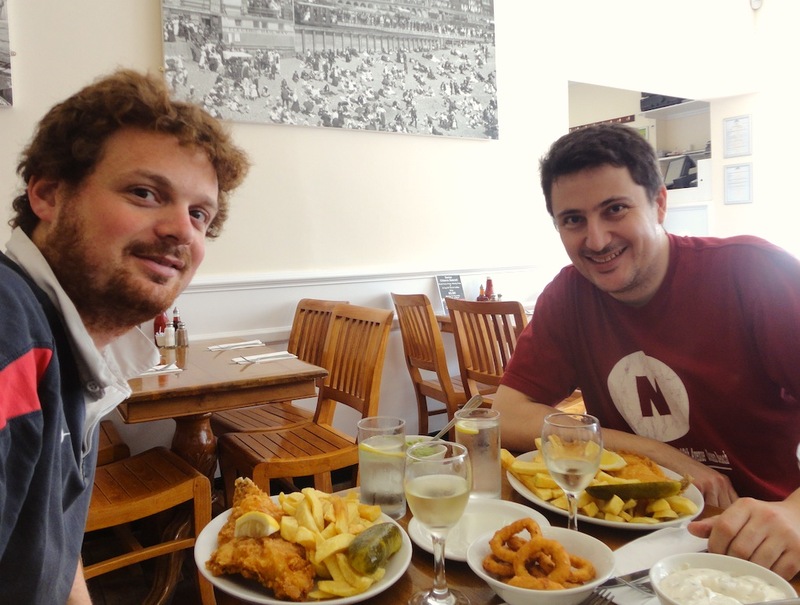 These days fish and chips have become largely confined to gastropubs and chippies to seaside towns, where tourists expect to eat seafood. 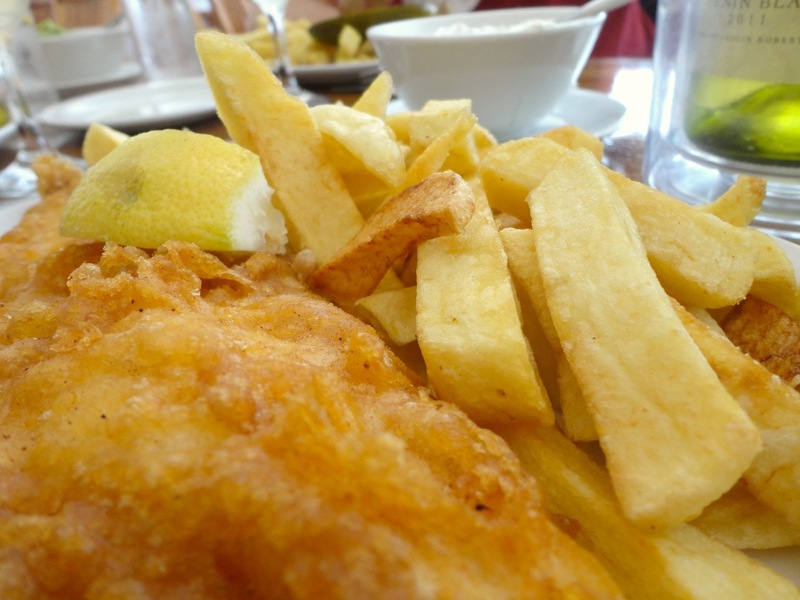 For that reason, no visit to the seaside is complete without taking advantage of the chance to eat freshly-caught fish encased in that crisp golden batter, fried in front of your eyes..
Brighton’s popularity with the monarchs of the 17 and 1800s made it the place to be seen for society’s hoighty toighty. Many believed that bathing in sea water could heal a variety of ailments and so those with the means to began making regular visits to take ‘the salt-water cure’. 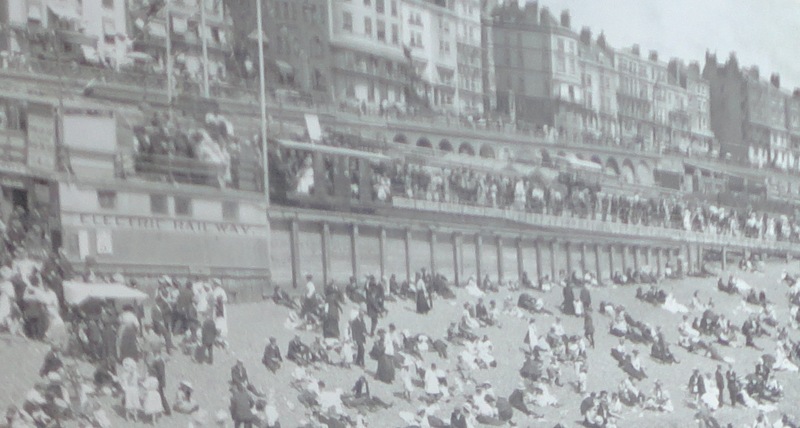 Then, with the building of a railway connecting it to the capital in the 1840s coinciding with the invention of Bank Holidays, its popularity exploded and day trippers started coming to Brighton in their thousands. The photo depicts a beach bustling with people – all rather over-dressed by today’s standards – enjoying a day by the sea. In the background, you can just about make out Volk’s electric railway, the world’s first electric public transport. The previously poor fishing town of Brighton was clearly enjoying a boom in construction and in prosperity. 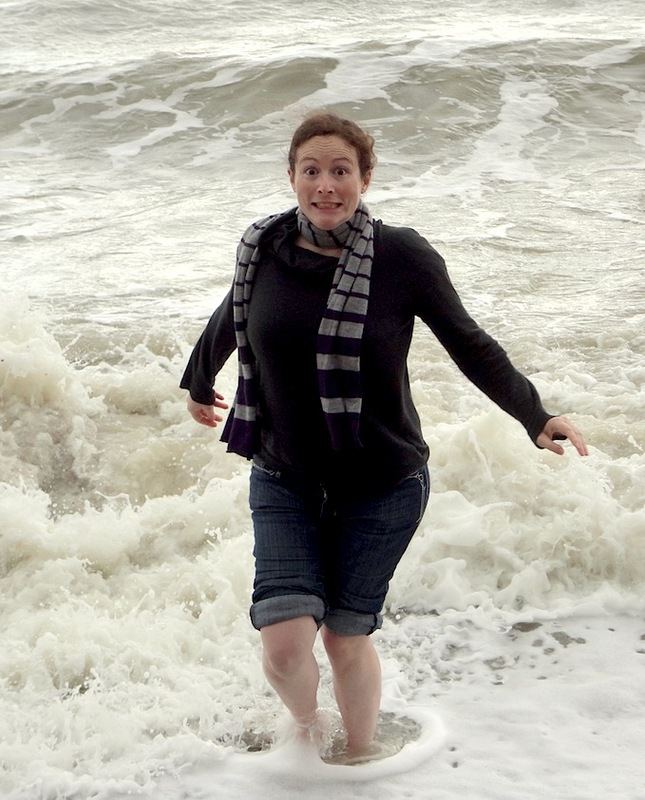 Sadly, the peak in popularity of the British seaside has long gone and, as travel has gotten cheaper, most people choose to take their ‘salt water cure’ abroad in sunnier climes. 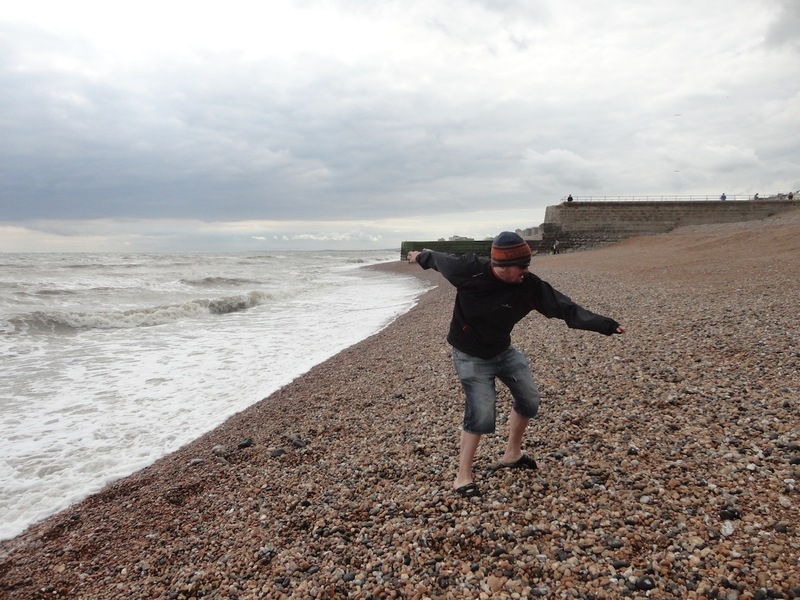 On our day in Brighton the beach was mostly deserted despite it being mid-July and the first sunny day in months. Many of the elegant beachfront hotels now look rather dilapidated and there is a general feeling of faded glory, reinforced by the sight of the burned-out hulk of the old West Pier, abandoned out in the sea. The railway is gone along with much of the old scenery. 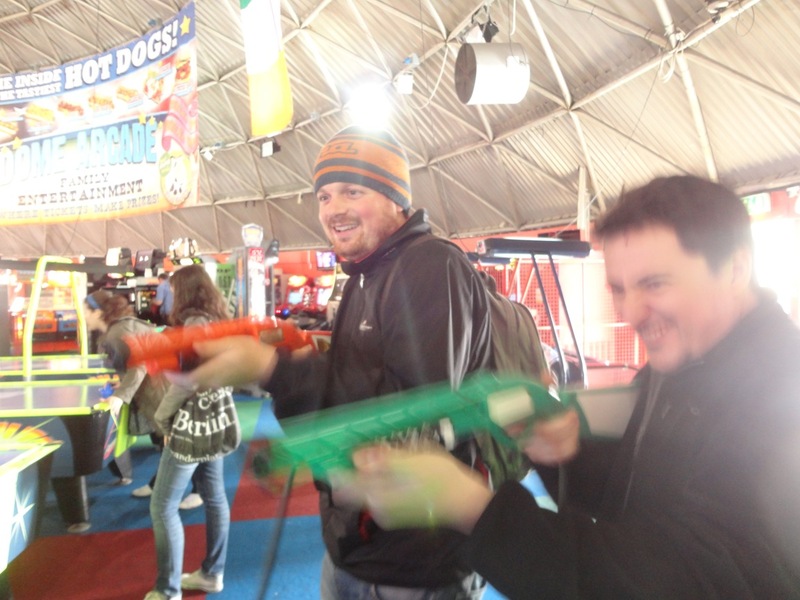 Most of the waterfront action has moved to the amusement arcade on Brighton Pier, where the Vegas-like sounds of the slot machines are enough to drown out the sounds of the waves against the pebbles. 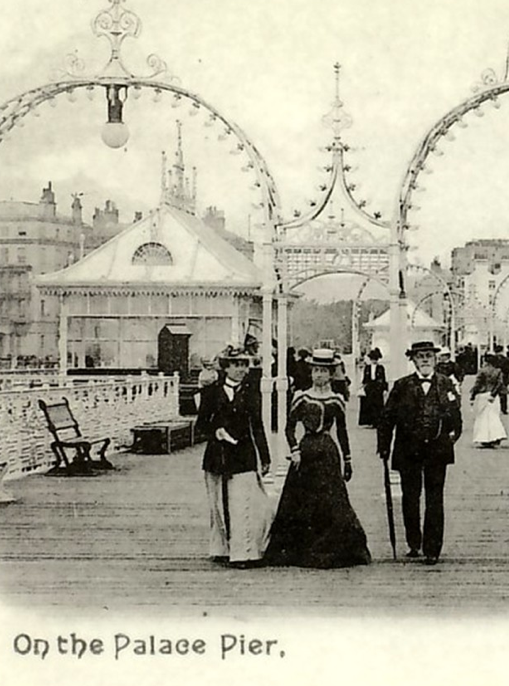 Brighton Pier (then Palace Pier) circa 1902 – No arcade machines back then! 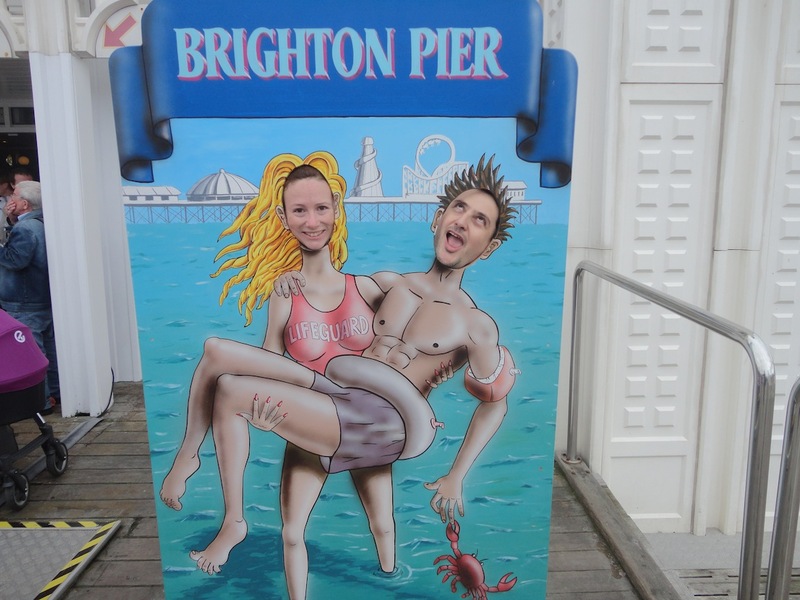 Despite the decline of the British seaside, however, Brighton has still managed to prosper and forge its own identity. Away from the beachfront, a warren of small streets known as The Lanes flourishes with independent shops, cafes and antique dealers. Parks, music venues and the stunning Brighton Pavillion (previously George IV’s seaside residence) await visitors who stray from the beach. A diverse population of people walk the streets. Perhaps due to it being somewhat of a haven through the years for people wanting to get away from the constraints of daily life and let their hair down, a strong laissez-faire party atmosphere developed and this atmosphere was fuelled by growing numbers of students and a burgeoning GLBT community. 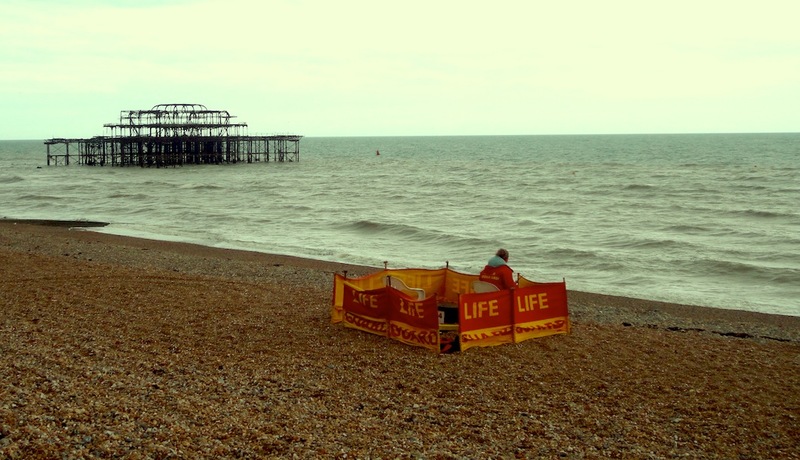 For better or worse, Brighton eventually became famous for its vibrant and heavily drug-influenced clubbing and music scenes. 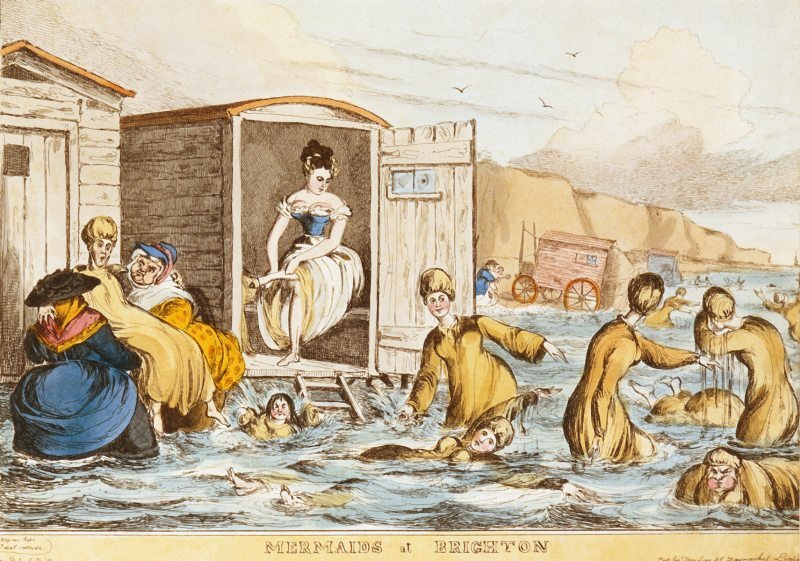 It does make me chuckle that, just over a century ago, women and men bathed separately and used ‘bathing machines’ – wooden carts pulled into the sea – so that their modesty was not compromised. Today, if you were to hit the clubs of Brighton, you’d be hard-pressed to find someone wearing more clothes than a Victorian-era swimmer. 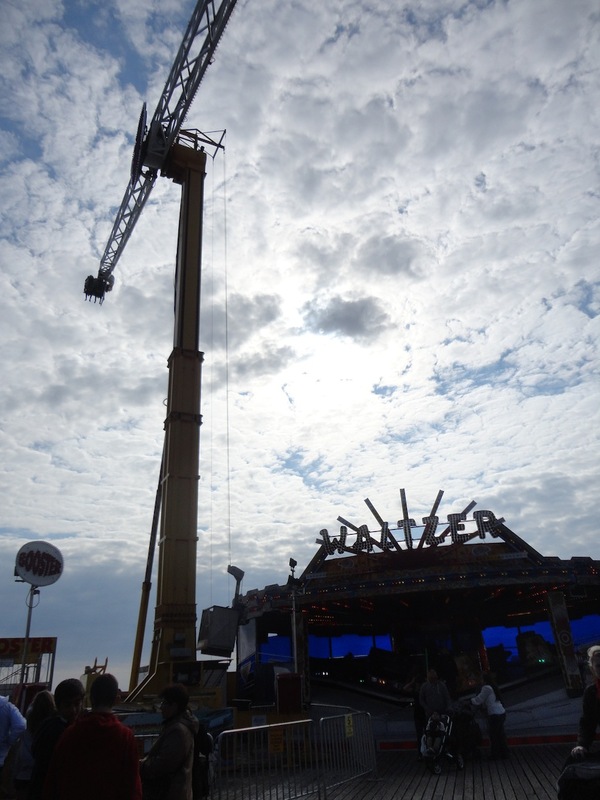 Call it tacky, call it cheesy, this is modern seaside entertainment – for the tourists at least. 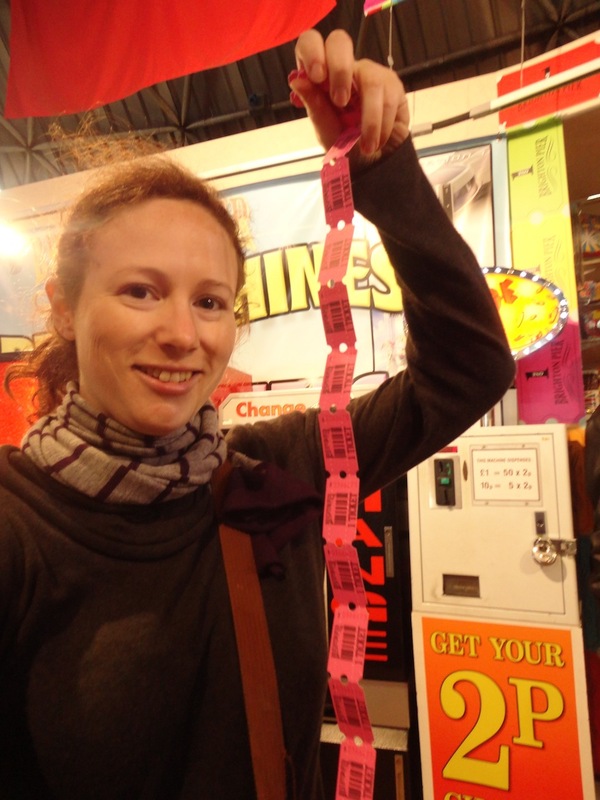 From Blackpool to Brighton, every resort worth its sea salt has a pier and that pier is generally populated with arcade machines and dodgy-looking funfair rides. Those are sunclouds, not rainclouds – honest! For some reason there’s something about being in Brighton that makes it feel totally acceptable to pour a nice dinner’s worth of 10p coins into a machine just to win a box of flimsy dominos; to throw aside all respect for your life and climb aboard a rickety ride that looks like it’s about to fly into the sea; or to pay for the privilege of throwing balls at coconuts. Perhaps the frenzy is partly due to having consumed ridiculous amounts of sugar since, after fish and chips, some of other most prevalent of edibles are generally of the disgustingly sweet variety – boxes of fudge decorated with postcard scenery, long tubes of hard candy known as rock and, last but not least the…. Soft creamy ice cream, twirled into a cone, drizzled with neon-red or chocolate sauce and then unceremoniously transfixed with a Flake chocolate bar. It’s certainly not the most sophisticated of ice creams and it traditionally comes in only one flavour – take it or leave it. 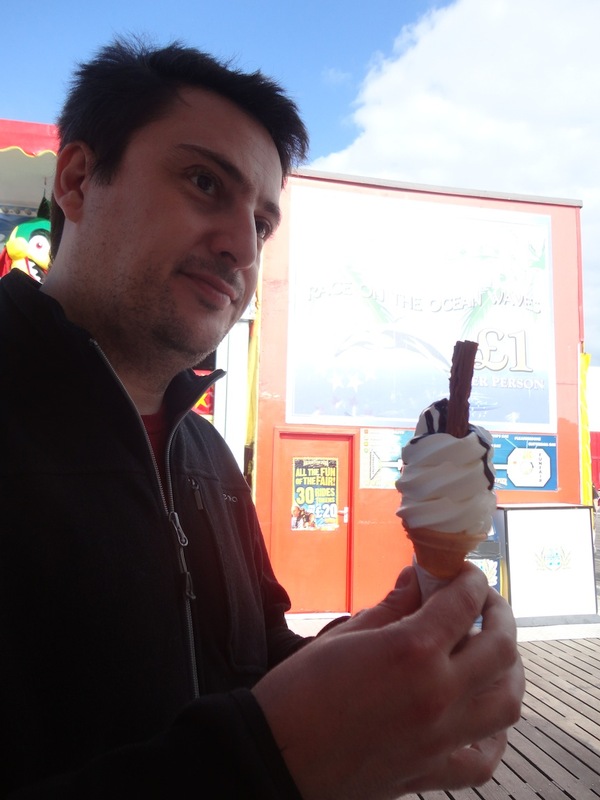 For most Brits though, a 99 Flake is the embodiment of summer holidays. It brings memories of being bored and then suddenly hearing the jangling music of the ice cream van, of begging parents for spare change – hurry uuup! – and bursting out of the house to jostle for a place in line. We may be older now, but nosh down one of these bad boys and it might just give you the edge you need to win a round of crazy golf. In time honoured tradition, the day ends with the slow trudge back home, skin tight and sticky from sea spray, pockets lighter and limbs exhausted from a long day of walking over pebbles. After a beautiful St Swithy’s Day for our Brighton extravaganza, London prepared itself to absorb the next 40 days of sunny weather. Sadly, as I write this, the drizzle is back with gusto, treating various Olympic events to a little soaking. Chin up, folks, we’re in Berlin now so its only a matter of time until the watery British sun comes back out! 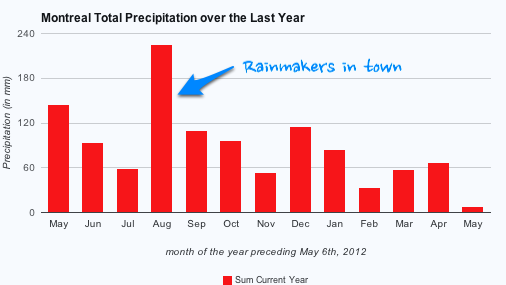 The Rainmakers are coming – Ruuun!